Now you can eat—and more importantly, drink—like an 18th-century denizen with Outlander Kitchen: The Official Outlander Companion Cookbook. 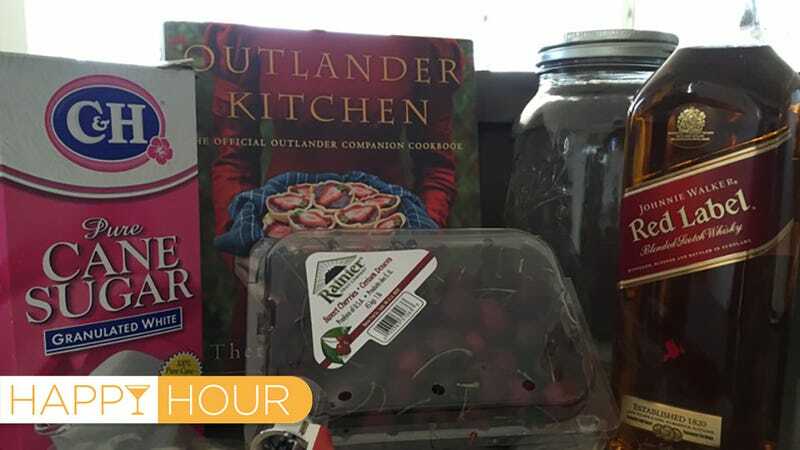 It’s based on the wildly popular Outlander Kitchen blog by professional chef and food writer Theresa Carle-Sanders. That, in turn, is a tribute to the wildly popular series of Outlander novels by Diana Gabaldon, and the TV series of the same name. It’s basically a time travel saga, in which a World War II nurse gets sucked back in time to 18th-century Scotland and falls in love with a hot Scottish hunk, despite having a husband back in the 1940s. So she’s cleverly adapted traditional recipes to create dishes for the modern palate and kitchen. For the cocktails section, many of the recipes are more “character-inspired,” like Jamie’s Rusty Nail—basically scotch whiskey and Drambuie on ice, with a lemon twist. Of the genuinely vintage recipes, I would have loved to try the Syllabub, a dessert-like concoction of milk and sweetened wine whisked into a froth. Let it sit overnight, and it will separate, the sweet wine sinking to the bottom. Folks would sip the wine through a straw and use a spoon for the creamy goodness. (Carle-Sanders’ version is made with cider instead of wine.) But it’s tough to get raw milk in the US and we irradiate the hell out of our whipping cream, so you won’t get that crucial separation. So I opted to make the Cherry Bounce, essentially a sweet whiskey infusion. “The more historical research you do, the more you realize that a lot of people were at least tipsy half the time,” Carle-Sanders said. Given the relative lack of potable water, 18th-century folks drank beer during the day, switching to wine and liquors like Cherry Bounce in the afternoons and evenings. A batch of fledgling Cherry Bounce. The original Cherry Bounce really was sickeningly sweet. “It actually verges on undrinkable for our palates,” said Carle-Sanders, which is why she cut the sugar drastically for her modernized version (see recipe below). She recommends a good mid-priced scotch blend whiskey for making bounce—why waste your pricey single-malt? And since most people won’t be able to find true sour cherries in their local grocery store, she’s added lemon juice and grated lemon rind to add a touch of sourness. It’s super-easy to make Cherry Bounce. Mix together all the ingredients, seal in an air-tight Mason jar, and then just let it sit for six to eight weeks. Then strain it out the liquid from the booze-soaked cherries, and voila! You can use the cherries as garnish over ice cream, too. Granted, this is an old-fashioned method for making infusions—in recent years, instant infusions have been all the rage—but there’s something satisfying about the slowness. Whiskey is especially good for infusions, according to chemist and infusion aficionado Ray Burks, because it has such a high alcohol content. It’s possible that the 18th century version involved a bit of fermentation, assuming some yeast found its way into the (likely unwashed) cherries and survived its contact with the alcohol. It could feast on all that sugar and boost the alcohol content of the final bounce even higher. You can drink Cherry Bounce straight up and it tastes just fine—the sweetness makes it ideal for an after-dinner drink. But we also tried making a whiskey-based (as opposed to traditional bourbon) Old Fashioned cocktail, with excellent results. Just pop a fresh pitted cherry into the glass, along with three dashes of bitters. Add an orange slice and muddle the fruit. Then pour two ounces of Cherry Bounce into the glass and stir. Add ice cubes if you like your cocktail on the rocks, and garish with an orange slice. Stir together the cherries, sugar, lemon juice, and lemon zest in a 2-quart jar until the sugar is dissolved. Pour the whiskey over the top and stir again before covering with a tight-fitting lid. Store in a cool, dark place for 6 to 8 weeks. Taste for sweetness and add 2 TBSP more sugar if desired. Close the jar and return to its waiting place up to 2 more weeks. Once it’s to your liking, strain the bounce through a strainer lined with a few layers of cheesecloth or a clean linen or cotton tea towel that you don’t mind permanently staining. Store in a glass container in a cool, dark place.